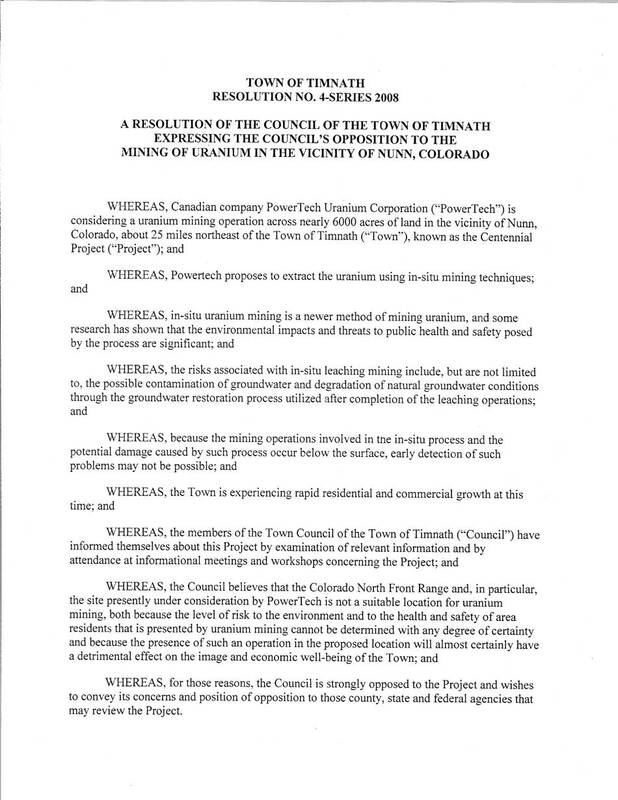 Timnath Town Council calls on EPA, State of Colorado, and Weld County to "deny any and all permits" to Powertech Uranium Corp. 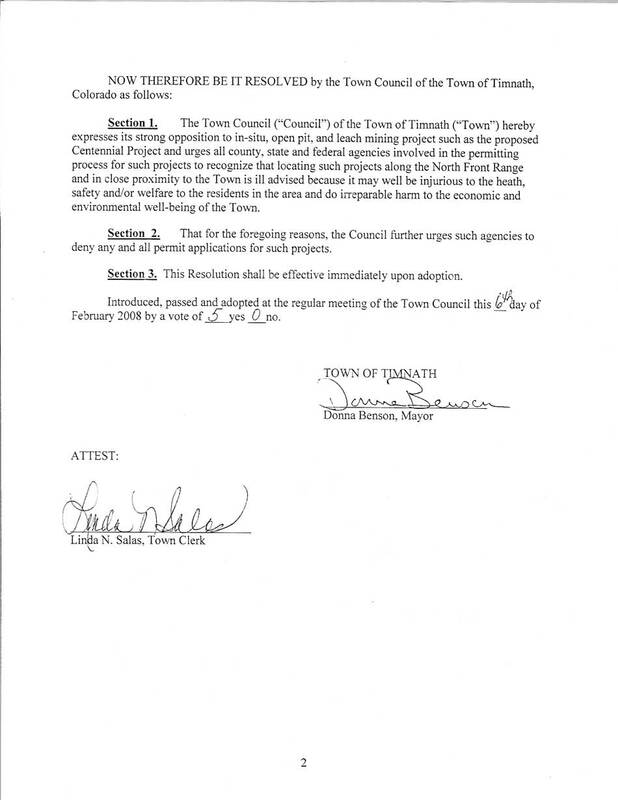 In a unanimous 5-0 vote, councilmembers of the town of Timnath approved a strongly-worded resolution opposing Powertech Uranium Corp.'s proposal to mine uranium just north of the town. 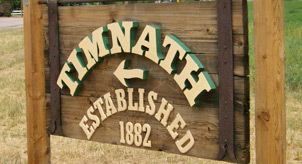 The southernmost mining area would be only 10 miles from the center of Timnath. The resolution calls on "all county, state and federal agencies involved in the permitting process... to deny any and all permit applications" for the project "because it may well be injurious to the health, safety and/or welfare" of town residents and because it may "do irreparable harm to the economic and environmental well-being of the Town." The council's resolution follows on the heels of the December 4 unanimous vote of the Fort Collins City Council on a resolution which also urges permitting agencies to deny all permits. Both resolutions speak to the proposed mining project's close proximity to growing residential and commercial areas. The Town of Timnath has published a map of its Growth Management Area and is in the process of seeking approval of the GMA by the Larimer County Commissioners as part of the proposed Larimer County/Town of Timnath Intergovernmental Agreement. On Wednesday, January 30, 2008, the Larimer County Board of County Commissioners will hold a public hearing to consider adoption of the IGA. The northeastern corner of the GMA is at the intersection of Larimer County Road 52 and the Larimer/Weld county line (WCR 13). This point is a mere 3.5 miles from the southernmost section of land slated for uranium mining by Powertech, and only 4 miles from the actual uranium ore body. The uranium deposit is relatively shallow (80-125 feet below the surface), and lies above the water table. The only proven method to extract this uranium is by open pit mining, although Powertech officials insist they are devising some new way of mining this deposit that is less environmentally-objectionable than digging an open pit. The Town of Timnath is planning for residential, commercial, and/or industrial development to occur within its GMA, and Powertech apparently believes it is politically and economicaly feasible to conduct uranium mining four miles from such planned urban density development. A map of the proposed Timnath GMA is here.